If you want to truly understand humanity and the full spectrum of life experience, don’t go to Burning Man. Go to Delhi. There, the gods cut a prism to bend waves of dark and light, casting a multitude of shades that flood the city’s crevices. Life breathes hot down the neck. Music blares from corners you didn’t know existed. You are immersed in the entirety of the human condition. The last time I came to India I was a backpacker, traveling in a Californian induced frenzy to ‘find myself’. ‘Finding myself’ translated to hanging out in lush gardens of a Kerala ashram to commune with ex bankers and ex lawyers and other aspirational hippies that could afford to take months off to meditate away upper middle class problems. We vowed to go back to our respective countries and be calmer, healthier, more enlightened version of ourselves. A few years later I realized how similar “enlightenment” and “entitlement” sounded. This time, I didn’t want to only traverse safe passages. I wanted to SEE India, all parts of her jumbled together out on the hot rotting pavement and swaying serenely amid cool, marble-floored temples. “Is this normal?” I asked, stomach ready to spit up my coffee, unable to digest the words that described the incident in bloody detail. “Unfortunately yes. Every day.” Our friend, a Delhi journalist, reported that they usually had six rapes reported by 5pm. And then there were the murders and bribes and other crimes. Is the problem Delhi or is the problem just people? The US has a population density of 84 people per square mile. Montana, where I was born, has 7. Delhi has 43,000. 43,000 people in a square mile, all striving to survive together. If we hooked up an IV to the US and transfused it with millions more people, I wonder what we would become? How would humanity show itself? In Dehli, it shows all parts. You are in the bellybutton of life. In some neighborhoods I had to be careful; in what I wore, where I went, and whom I spoke with. Emaciated beggars rapped on the car windows as we stopped at lights in overpopulated intersections. Men stared at me lewdly as I walked through the stones of old town, despite being covered up. But if I stayed home, I’d miss out on all the other spectacles of light where scarves fell to the floor as I danced in joy. Delhi neighborhoods spill over into each other like different flavored scoops of ice cream melting in a bowl. Not too far from the old town is the middle class Bengali neighborhood, Chittaranjan Park. Fresh saris, sticky ghee sweets and red bindis on the foreheads of children embellish the concrete structures. We went there for Durga Puga, a festival celebrating the victory of the Goddess Durga over the buffalo demon, which epitomizes the victory of Good over Evil. It was a reminder that no matter which demons chase us, the goodness of humanity will fight to prevail. Dussehra was the next day, one of the most important Hindu holidays. Mother Goddess is invoked to start the new harvest season and reactivate the vigor and fertility of the soil. 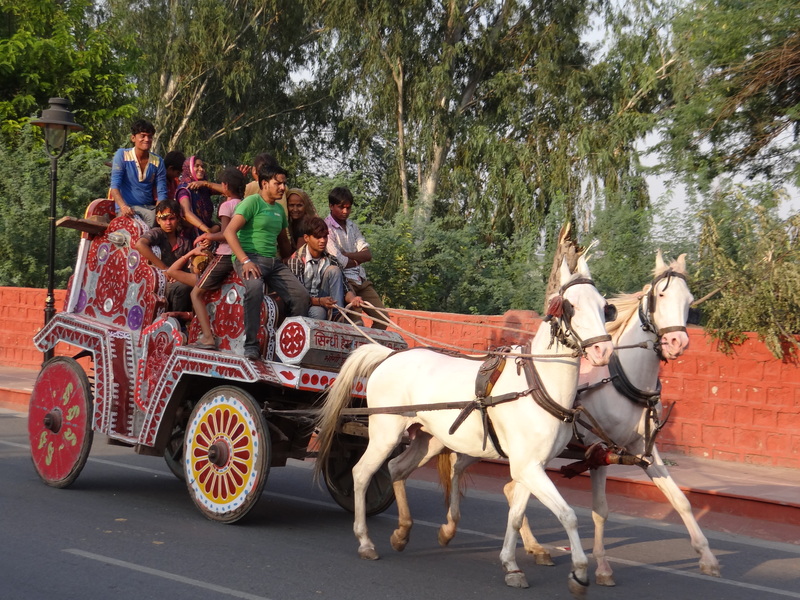 We traversed out to small villages dotting the canvas near Fatehpur Sikri to see the celebrations. Huge families from the wrinkled grandmothers to the 2 year old children skipped down the streets following decorated trucks (and horses) blaring music. Poverty is not an indicator of unhappiness. These villagers had community, song, and fresh chapatis. They lived for the moment, unburdened by our western plague – expectation. Another day our Sikh friends invited us to come with them to Gurdwara, a Sikh temple of marble and gold, to partake in prayer and a meal. The Gurdwara is run by volunteers who make three meals a day to feed anyone that comes in. Over 20,000 hungry mouths are fed each day. All one has to do is arrive from the chaotic street, and wash their hands and feet before climbing up the marble steps. I have never seen such generosity at such mass scale. We sat, bellies full, and listened to prayer for two hours, its song wafting up into the night’s sky, touching the stars. Delhi reminded me that to experience life, you must head out into its chaos. You must be careful, but you must also venture out with an open heart, ready for human joy to overwhelm you in the least expected moment. Night at Gurudwara Bangla Sahib, listening to prayer. Unfortunately, I think many Americans are afraid of Delhi. Newspaper headlines stall them. Stench and poverty make them uncomfortable, even though this is how much of the world lives. The few I know that have seen Delhi, have only done so from the bar of their five star hotel, drinking (they think, cleverly) Bombay Sapphire. I suppose they may be safer. But they’ll be living a muted version of life possibilities. Any Indian will tell you that fresh made chai from the side of the road, served in a tiny clay cup, is the best beverage to be had in the country. But you have to leave the safe tourist spots (and the ashram) to get there. “Sit in the paradox of life” is perfect. I love your writing, thank you for sharing.